Whether you were a collegiate runner or not, you’ll find that running is something a lot of twenty-somethings pick up after graduating -- even if just for opportunities to post half-marathon finish pics on Instagram. A lot of people run to blow off steam, to escape stress, and to clear their minds. But that was never my experience. Even though I ran competitively in college and high school, I can’t say I’ve ever truly loved the motion of running itself. What kept me going was a fierce desire to compete, and more importantly, my teammates. Now almost two years out of college and submerging myself into the trials and tribulations of the “real world”, it turns out running gave me a lot more than #fitnessgoals. My time as a student-athlete at Tufts was undoubtedly the highlight of my college experience—not just for the highs, but also most of the lows. Being an athlete allowed me to face a lot of challenges in a very small, controlled space, almost like a practice run for real life. In accordance with the standard millennial college experience, I faced a lot of anxiety throughout my senior year. Like other student-athletes, I was able to exert a lot of these pent-up feelings by “running it off”. But it eventually stopped working. At times, running sparked a lot of my anxious “fits.” I had doubts about my abilities to pull my weight on our varsity team, especially as we progressed into the cross country postseason, culminating with the fun-but-stressful-full-of-tears climax of the National Championship meet. Running did not just force me to face my anxiety head on, but ultimately, to overcome it. And ultimately, this is the gift of being a student-athlete. Any anxiety I felt was always at the forefront of my mind before of every race -- something a bit deeper than an athlete’s normal pregame jitters. 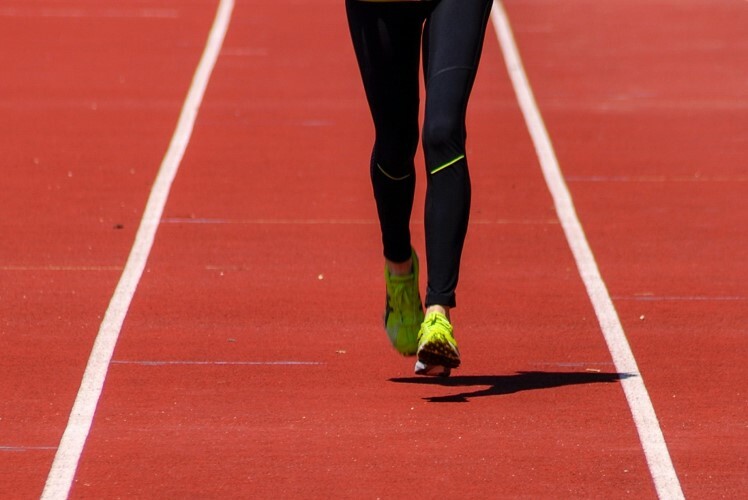 To shake it off, I would have to jump at the starting line three times, listen to the same playlist, and fulfill all of my superstitions to shake away whatever stress, academically or emotionally, I was facing. But from anywhere between five and twenty minutes (depending on the length of the race), competing forced me to fight my battles head on. Running is a sport that requires you to push every part of yourself to the absolute maximum, and ultimately, if I knew I could get through one race at a time it would get progressively easier to keep my emotions in check. Every practice and every race tested my ability to put aside my nerves and have faith in both my fitness and my team to get the job done and run as hard as possible. People are quick to categorize running as an “individual” sport. That is definitely not the case. Yes, you are solely responsible for getting yourself in shape to compete and be a part of the team, but once that part is done it’s all about the team. After every race, I gave myself a “Five Minute Rule”: if I raced well, I could celebrate it for five minutes before going to regroup with the team and see how everyone else was feeling. If it was a bad race, I had just five minutes to get over it, decide the next race wouldn’t be the same, and immediately go cool down with the team. Here’s why college sports are a tryout for real life. Athletes have to learn to achieve the work-life balance a lot earlier than other students, giving us an edge and a hunger that a lot of other students cannot understand. Much like in races, I felt ready to max out professionally, socially, and to really absorb the experience of living in New York. When I graduated, I found myself facing a lot of similar anxieties with the transition of moving to New York and leaving behind a sport that glued my life together for eight years. I felt all the more ready to navigate the work-life-running-relaxing balance because overcoming the small challenges in running had prepared me for what lied ahead. Now almost two years out of college, it’s clear that a lot of the struggles I have faced since moving to New York have been minimized by the “Five Minute Rule” way of thinking. Many subway breakdowns were mitigated by this rule, since living in an Upper East Side basement with two complete strangers and working in a grueling political consulting job tested my stress threshold. I was eventually able to pivot. I left my job and decided to pursue my greater passion for health care and health equity. For almost a year and a half, I have been working for Children’s Health Fund - a Harlem-based non-profit organization that works with hospitals and community health centers across the country, as well as schools in New York City, to deliver high-quality affordable health care to underserved children and their families. Since we are a fairly small organization, I have had to wear many hats - be it grant-writing, data analysis, program management, and conference planning. However, I attribute a lot of my abilities to take on different challenges and push myself in the workspace to being a student-athlete at Tufts. After graduating, student-athletes may only quantify their experience by counting the number of championship rings or personal bests they reached. But it is important to not underestimate the more abstract takeaways. The character building and challenges you face as an athlete on a daily basis are the biggest takeaways you’ll carry with you into your career, relationships, and hold close rest of your life. Now that I am starting to run again and will race my first half-marathon in May, I can truly say that whatever issues I’m facing now pale in comparison to the challenges I faced as a student-athlete and I feel stronger from it. And if you’re still in college and can relate to anything I’ve said above, my only message to you is this: embrace the anxiety, and don’t be afraid to max out.